Specific Industry: Clinical therapist & psychologist in Nicosia, Cyprus: Private clinic providing confidential therapy, psychotherapy, counselling & other psychological help on an individual basis, to children, adolescents, couple, married couples & families in Nicosia & throughout Cyprus. 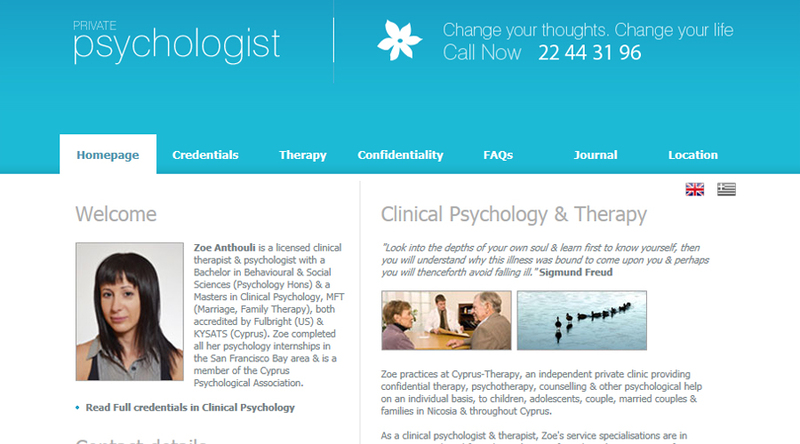 Newly established Nicosia-Cyprus based clinical therapist & psychologist, Cyprus-Therapy approached Web-Conceptions to handle their entire website development and online strategy. More and more, people are using the internet to locate the services they require, including clinical therapy & psychology. In Cyprus, this was a sector that was significantly underrepresented online. As such, a new website in this area was sure to produce immediate results and rank highly. In any case, it was fundamental that client had at least some sort of web presence, both for overall exposure (i.e. as reference to the newly established practice to potential clients in Cyprus), as well as for reputation and credibility to the psychological services. Beyond this, the site could also act as an ideal first point-of-contact, providing information and direction to all those in need. Indeed, marketing the website (i.e. search engine optimisation) would also be an ongoing process, with online strategies, as well as other marketing mediums, namely with an on-going journal, social media and word-of-mouth. Web services that were provided include complete website solution, including initial consulting, online business strategy, web design concept, programming development with elements of Content Management System (CMS) for updating the psychologist's journal page, RSS for international psychology news, therapy/psychology industry content research & writing, editing content provided by the psychologist, translation and pages into the Greek language, SEO key word analysis and implementation, online and Internet marketing business strategy, on-going tracking & monitoring, domain name, and hosting service. Focus for this project was on all necessary technical aspects of building a website and achieving good SEO. Crucial elements of the site were in content in order to secure decent ranking. Even more important was the initial key word analysis by market, such as what are the main words and phrases people are searching when seeking the services of a clinical therapist & psychologist in Nicosia, Cyprus. Interestingly enough, this revealed some surprising results, which then were of course implemented into the overall approach. For instance, what is the number word people in Cyprus search when seeking the services of a clinical therapist & psychologist? You would think therapist, psychologists? Well it was not. It was something else, that although now makes sense, was not so obvious in the beginning. This project followed now standard procedures for the Web Conceptions team. First, brainstorming with the client in order to set the project's scene and an overall perspective. Then, researching the therapy and psychology sector, as well as benchmarking in order to clarify exactly what would be required to be number one. When all preliminary groundwork was done, Web-Conceptions presented the client with a number of website base structures and what possibilities could be achieved. Together they chose the most suitable design and began full customisation. Immediately the site ranked highly in Yahoo's search engine. Google's spiders to somewhat longer time to start crawling the site. Now, the site is ranking highly and continues to improve.